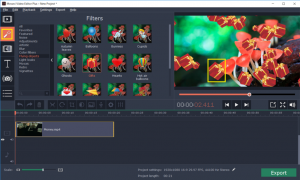 Best Video Editing Software for Laptops: Can an App Cut Down Render Times? If you’re reading this article, it means you’re looking to use your laptop to touch and render videos. And it also means you’ve probably read tons of Q & A threads where people share horror stories of how their laptops have seized up while working with processing intensive footage. Laptops in general do not have the muscle power for resource hungry video editing software solutions. They heat up. They crash. They shut down. Or are pretty much useless for anything other than the ongoing file rendering. Thankfully though there are exceptions to the rule though. 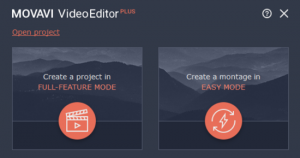 Applications like Movavi video editor are light-weight, streamlined yet they pack a big punch in terms of special effects and editing functionalities. A 1:4 render time ratio is common for videographers who work on laptops. It takes four times longer than the actual footage length to render a file that has seen medium editing. 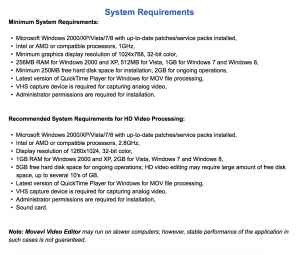 However, Movavi not only expedites this render process, since it uses as little as 256 MB of RAM for a Windows 2000 set-up, it also leaves more CPU cycles and memory free for simultaneous execution of other tasks. Long story short, you can do a lot more with your laptop – even if Movavi is working in the background to export and save your edited video content. 1. The first thing that you need to do is launch the application by clicking the icon on your laptop Home screen. This fires up the Welcome modal. Now there are two ways to start a fresh project. You can either go the whole hog and create a movie in Full Feature Mode. Or you can rustle up a Montage in three clicks. For the purpose of this article, we will go with the Full Feature Mode. 2. The Movavi workspace is clean and uncluttered. The main editing options are stacked vertically to the left. The first icon, which resembles a YouTube play button is the Import option. It is selected by default. As you can see, Movavi gives you the freedom to import videos and clips from the Hard Drive of your laptop using the Add Media Files tile. 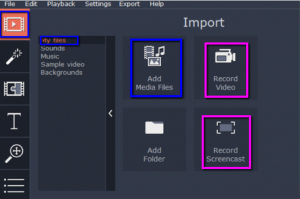 Not only that, you can also bulk import a folder or shoot a video or screencast directly using the integrated camera and microphone in your machine. This is an example of Movavi’s laptop friendly design. Use the pair of Scissors and snip the clips at the positions indicated by the orange location finder. Adjust and enhance the colours of the video clips with Colour Adjustments. Directly record a voice over for the selected clips using the laptop microphone. 4. Next it is time to get fancy with filters and effects. Most of the icons to the left, below that of Import, have to do with the visual magic that the Movavi Video Editor can weave. The icon that resembles a magic wand gives access to a plethora of filters. Some like the Flying objects are almost kitschy. Others like the Vignettes are subtler and best for content that doesn’t have a very busy background. The icon that resembles puzzle pieces stands for a mind-boggling variety of transitions. There are tasteful Geometric transitions, loud and bold Warp transitions and a whole class of Artistic transitions for those who appreciate the softer touch. The effects are easy to apply. 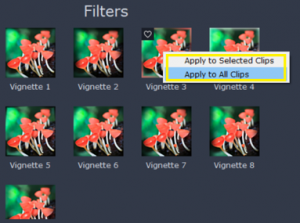 Simply click and choose the clip you wish to enhance on the time-line, then select the filter or transition you want to apply, and right click the selected effect to add it to the clip or position it after the clip. You can also add Stickers and Text captions. The options are almost unlimited. 5. When you are happy with your handiwork, it is time to share it with the world. 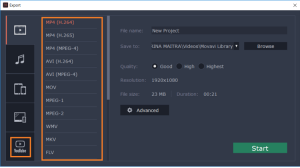 Movavi renders files in dozens of common and not so common formats. The updated versions even boast the ability to process RAW content. Based on where you’ll be using the home movie, you can go with a final file format that doesn’t require resource exhaustive rendering. You can also directly upload the video to YouTube. Another nod in the direction of on-the-go movie makers who work on their laptops. 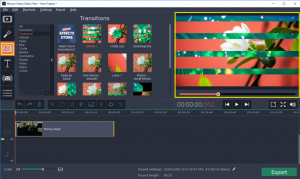 The best video editing software for laptops should balance features with speed of rendering, without locking all available processing power.